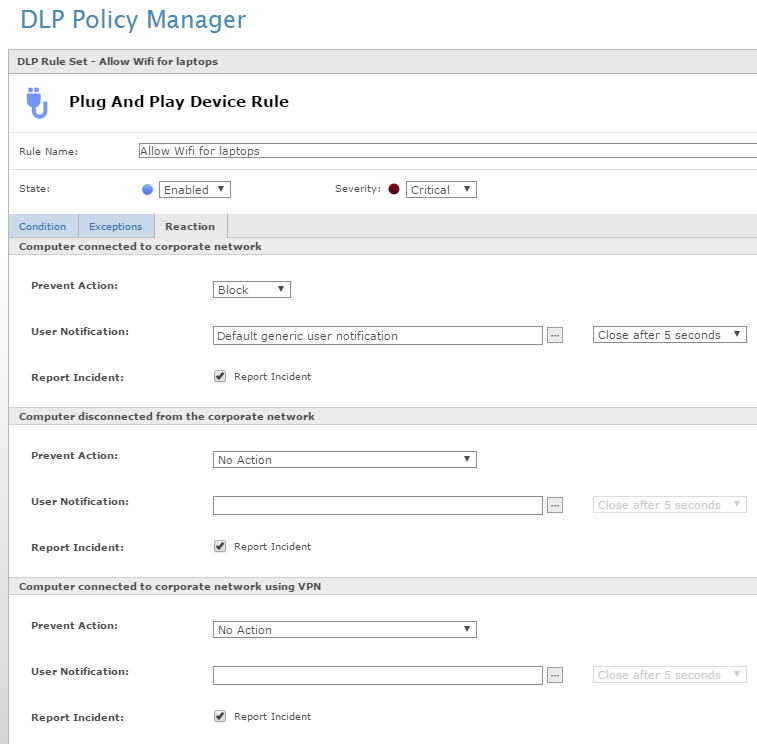 The following will show how to configure a device control rule to allow computers to use wireless outside the organization with or without VPN and block the WIFI devices when the computer is in the corporate network (connected via cable). 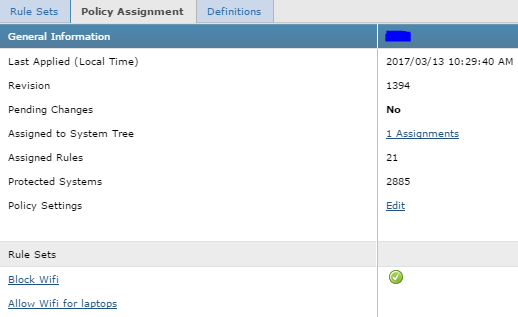 ​Go to Policy Catalog, edit the agent configuration->corporate connectivity. Under "corporate VPN Detection" choose an IP Address and port that is available only when connecting via VPN. Network Adapter is unmanaged by default, so you need to change it to Managed. 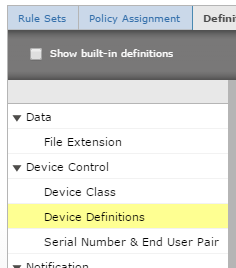 On the right, click on Device class and choose "Network Adapter (Unmanaged)" or "Modems/Faxes"
On the right click on "Device Friendly Name " and write all the patterns that WIFI devices can include in your organization. 3. Reinstall the DLP Endpoint, restart the system. The problem as been solved and the DLP Endpoint status changed from "Drivers installation failed" to "Agent is running..."
Version 9.3.x and less - From DLP Policy in ePO console export the policy. 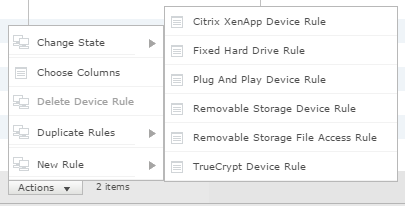 Version 9.4.x and less​ - To export the policy we want to enforce on the stand alone system we will go to managed system with McAfee DLP client installed. Change the name of the file "Configuration.opg" to "GlobalPolicy.opgc"
Create a new key "PolicyInjection"
In Internet Explorer, go to Tools, Internet Options. Failed to install Data Loss Prevention 9.x. 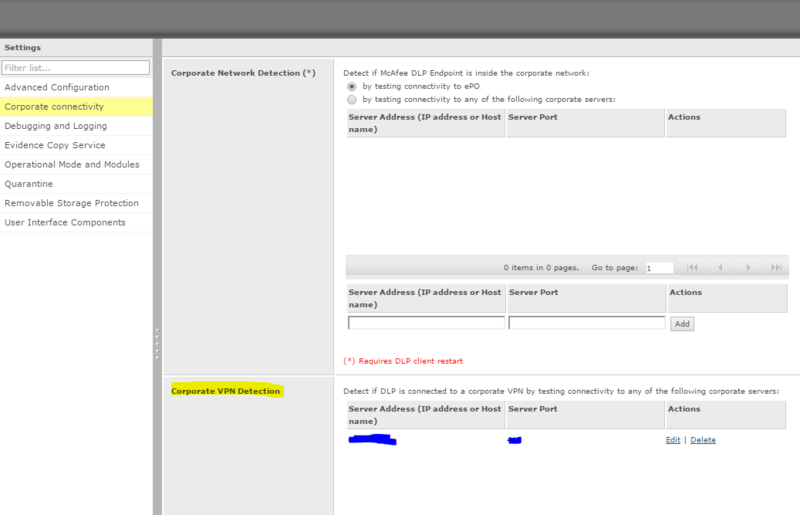 failed to deploy DLP agent from ePO and install it manually. Go to Add/Remove program and uninstall all the program start with Microsoft Visual C++. After uninstall all the Microsoft Visual C++, Restart the system. "Error 1935.An error occurred during the installtion of assembly 'Microsoft.VC80.CRT,Type="win32",publicKeyToken="1fc8b3b9a1e18e3b" ,processorArchitecture="amd64"'. Please refer to Help and Support for more information"
When you installed the DLP extension you didn't update the license of DLP. DLP is one of the only McAfee Products that need a license update in ePO server.